The athletes in your classroom will love putting themselves in the shoes of basketball players, volleyball players, coaches, and even the equipment with these fun-filled passages!These quick reading passages put a fun spin on challenging students to think about multiple perspectives/point-of-views. These quick reading passages put a fun spin on challenging students to think about multiple perspectives/point-of-views. Students will read a short story from the perspective of one bystander, and then write the story from two different characters' points-of-view! Students will read a short passage about an athlete's first volleyball game since an injury. She's been training for weeks, but is still a bit nervous. Her mom watches from the crowd even more nervous than she is! However, the athlete has a great play and Mom begins to cheer! Students will rewrite the passage from the athlete and the mother's points of view! • Five short reading passages that challenge your young writers to rewrite the story from another character's point-of-view! 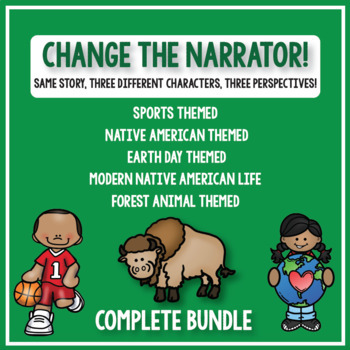 • Students will look for conflict, problems, solutions, emotions, and character traits to help them craft their stories! • Each passage comes with three assessment questions on plot, character traits, setting, context clues, and more! Questions are common core aligned. • Contains fun clip-art of each character and engaging, leveled writing!